There were lots of memorable moments at this year's Don Giovanni Showcase. For me, one of the most memorable was the set turned in by Providence, Rhode Island's Downtown Boys. There were wigs and saxophones and crowd surfs and communal on-stage audience dance and singalongs. And it was all in the service of speaking up for the outsiders and the marginalized. 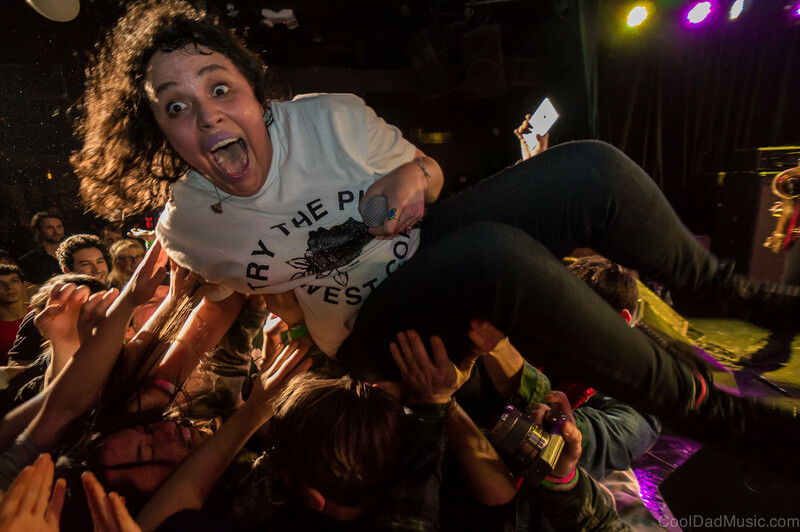 "With Downtown Boys, I really saw how and why punk can be so powerful. I saw how it has the ability to empower others, to help them articulate a voice and release a cathartic anger and energy. The things that Downtown Boys sing about are important. They scream at racism, sexism, capitalism and colonialism and do not ignore how these institutions intersect. The level of energy from the room spoke to the raw anger young people in this country feel towards these topics, and how needed it is for women, people of color, and LGBTQ to have a punk space of their own. As dozens of people in the crowd hopped on stage with the band to sing out, I won’t lie, I felt a little tear." On "Monstro," a single premiering at SPIN from Downtown Boys' upcoming Full Communism, singer Victoria Ruiz screams, "She's brown!! She's smart!!" as the pandemonium generated by the rest of the band rages around her. It is enough to cause a little lump to form in your throat. I get that little lump, that little dampness at the corner of my eye, not just because of the passion with which Downtown Boys deliver their message. I also get that feeling from the realization that someone in American popular music in 2015 is actually singing about these things at all.